News from the Department of Archaeology at the University of Reading · A rare Anglo-Saxon gaming piece makes the national news for the Lyminge Archaeological Project! 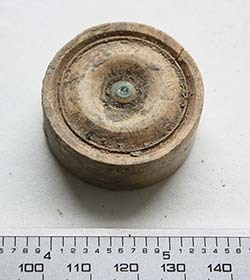 A rare Anglo-Saxon gaming piece makes the national news for the Lyminge Archaeological Project! Here’s what the BBC have to say about it! The Daily Mail report that this find suggests Anglo-Saxon parties weren’t always the wild mead-swilling kind! The Lyminge Archaeological Project is run by Dr Gabor Thomas and is also featured in the November edition of Current Archaeology Magazine.